4x6 Personalized Rectangle Shape Indoor Magnets 55 Mil Square Corners are excellent in creating a strong brand impression among customers. Retail businesses, brands and organizations can make the most of these custom square and rectangle magnets to display their promotional message in front of customers consistently. 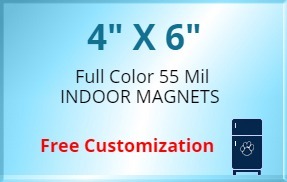 Facilities like free design, lowest price guarantee and no set up fee makes these custom magnets more impressive. Order these magnets today and get free shipping in the Contiguous USA. Request a quote to know the value savings that you can avail on bulk orders of 4x6 Personalized Rectangle Shape Indoor Magnets 55 Mil Square Corners.